Minnesota’s Renewable Portfolio Standard (RPS)—sometimes called a Renewable Energy Standard (RES)—was last updated in 2007. Most utilities have met it ahead of schedule. All but twelve states have some sort of RPS, twenty-nine of which are mandatory. Is it time for an update in Minnesota? What’s feasible? The RPS applies different schedules to the state’s utilities. Xcel Energy, the footprint of which covers most of the Twin Cities Metro, faces a steeper schedule; the bill treats Minnesota utilities that use nuclear power—Xcel is the only such utility—differently than the other utilities, whether they be investor-owned or cooperatives. The statute requires that the MN Department of Energy Resources, a division of the Department of Commerce, manage utility compliance with the standard on a bi-annual basis. 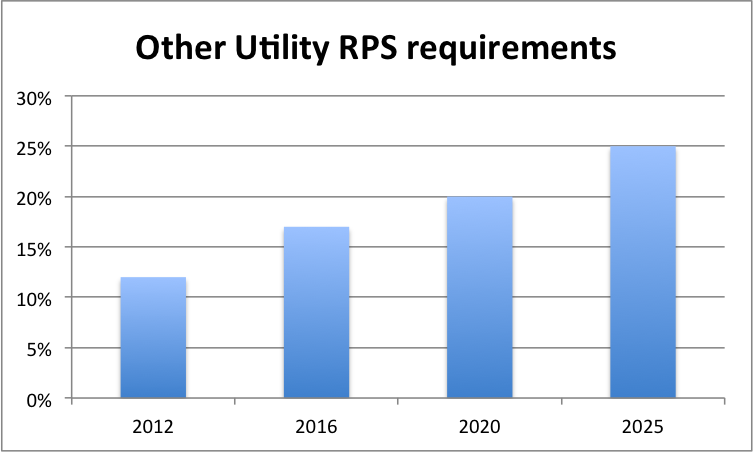 The latest of these, issued in January, 2017, confirms that all utilities subject to the RPS had met goals applicable to December 31, 2015. A recent report suggests that Minnesota’s utilities may be ahead of schedule, with statewide numbers at 25% renewable generation, which is above average compared to the rest of the nation. Climate hawks still have reasons to despair, however, as carbon emissions are slightly higher than the national average. * Power sector emissions nonetheless fell 27% from 2005 to 2017. The discrepancy between relatively high rates of renewable generation and worse-than-average carbon emissions likely stems from the state’s low reliance on natural gas (12% vs. 32% nationwide), which has replaced higher-carbon coal generation elsewhere. At 23%, nuclear power in Minnesota stands at slightly above the nationwide average. The state, as you might expect, has added several gigawatts (GW) of renewable capacity since the RPS mandate in 2007. Note that in the energy world, capacity is what it sounds like, as is generation; while the RPS measures generation, new capacity was needed to meet it. Capacity is measured in magnitudes of watts (W, kW, MW, GW, TW), and generation in magnitudes of watt-hours (Wh, kWh, MWh, etc.). Wind turbines comprised much of that new generation, until 2017, when solar—with a surge in community solar development—led the way. Source: Bloomberg New Energy Finance, “State energy factsheet: Minnesota,” March 1, 2018. So far, our discussion has omitted the solar mandate of 2013, which requires that all public utilities in the state meet 1.5% of all generation with solar photovoltaic (PV) facilities by 2020, 10% of which must be smaller systems under 20 kW in capacity. The 1.5% solar carve out comes in addition to the RPS shown in the charts above. For reference, know that the carve out only stretches the state slightly above the current national average of 1.2% of PV generation. Some reading this piece may wonder about the cost of the Minnesota RPS on utility ratepayers. Worry not! 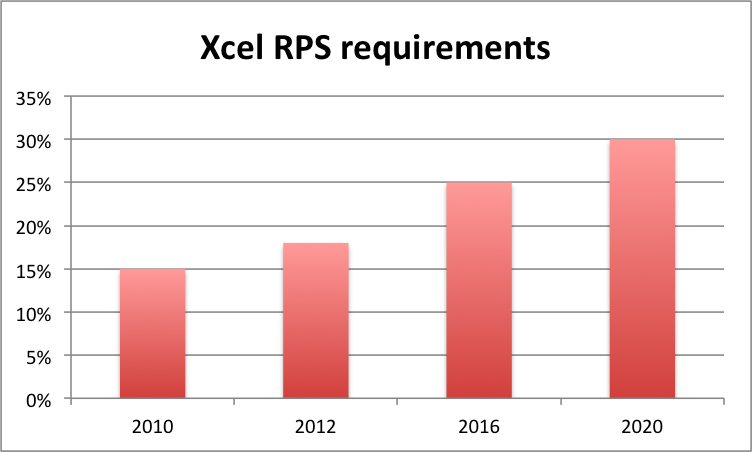 Even as of 2014, when renewables cost more than today, Minnesota Power and Otter Tail Power customers experienced a decrease in costs as a result of the RPS, while Xcel customers felt only a slight increase. More recent data reflects the falling cost curves of renewables globally: new hydro costs about 5¢/kWh on average; onshore wind, about 6¢/kWh; utility-scale solar, 10¢/kWh. These prices easily compete with fossil fuel-derived electricity, which can vary from 5¢/kWh to 17¢/kWh. Moreover, price does not reflect value. The periods where electricity demand is highest—hot, sunny summer afternoons—and therefore, the marginal cost of electricity is highest, often coincide with peak renewable production, especially solar. Witness the stunning solar victory in 2014, when the Aurora project beat out natural gas on price alone for peaking power. A recent North Star article discussed a Minneapolis proposal to power city assets with 100% renewable energy—an aggressive RPS in miniature (Minne-ature? Apologies.). Accounting for enough renewable energy to power a medium-sized city government’s assets is complicated, but feasible. What about the rest of the state? Or the country? Some, like Prof. Mark Jacobson of Stanford, have proposed that the entire globe could rely on 100% renewable electricity—and everything else!—by 2050. Such a global system would require massive investments in transmission, management software, electric vehicles, and hydrogen-powered aircraft, in addition to new renewable capacity. Others have challenged Mr. Jacobson’s methods, but still concluded that massive decarbonization of the electric grid, to 80% renewable, is feasible within a generation, pardon the pun. With the state’s utilities on track to meet Minnesota’s RPS on schedule and on the cheap, perhaps it’s time to do more. * Minnesota average .48 tCO2/MWh vs. nationwide average .45 tCO2/MWh (tons carbon dioxide per megawatt-hour).